So you’ve launched a brand new site, and now you need to get quality backlinks. Because links are one of Google’s top three ranking factors. So no matter how amazing your content or service is, it doesn’t have a chance to rank well unless you build links for SEO. So you need to get quality backlinks for your new site, even though no one knows you, your business, or your content. But don’t worry, there’s a way. 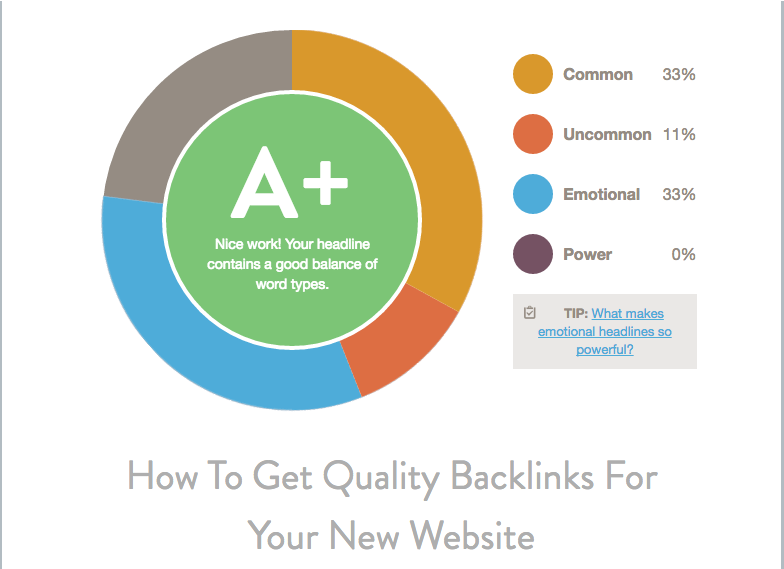 Read on to learn how to get quality backlinks for your new site today. Build backlinks from broken links. Find websites with broken or out-of-date links in your niche, and you have a perfect opportunity to suggest your own content as a fix. 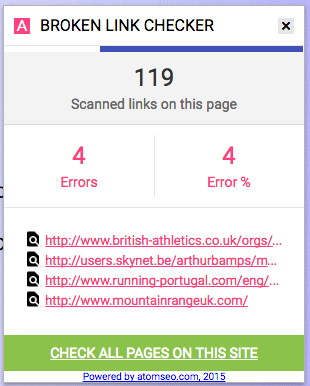 Next, I use a plugin like Broken Link Checker to see all the 404s on the page. If I find any broken ones, I can reach out to the webmaster and suggest a replacement link from my own site. This method usually works pretty well, because you’re helping them fix an issue with their site. Another approach instead of looking for pages with broken links is to find pages linking to outdated resources. Brian Dean calls this The Moving Man Method, and explains it well in this post. I’ll offer a brief overview here. Once you find an outdated page or resource related to your niche, plug the URL into a backlink checking tool to see what links are pointed at the site. Monitor Backlinks, Ahrefs, Majestic and Open Site Explorer can all do this for you. Next, you can reach out to these sites, let them know their link it out-of-date, and suggest a replacement — yours! If you run a business and just launched your website recently, then link reclamation is a great opportunity to get quality backlinks, because there could already be some high authority domains talking about your business but not linking back. Now my uncle can reach out to this site and ask them if they’d be willing to include a link. Bam! Two new citations. Gotta start somewhere, right? Stay on top of your brand mentions as they grow in the long term by setting up a Google Alert or Buzzsumo Content Alert. Opt for a weekly digest and make it a habit of checking the mentions for a link back to your site. Get quality backlinks with original research. No matter the niche, readers appreciate one thing: evidence. Blog posts that are all opinion and no stats and data tend to not resonate as well. That’s why all the productivity blogs link back to the latest psychology research, and all the marketing blogs link to Hubspot or Moz’s latest reports. But what if they were linking back to your research? Just because you’re new to your industry doesn’t mean you can’t do research that people want to link to. Get backlinks from social media. First of all, don’t get too excited about this option — you can’t get quality backlinks from every link you share across social media. 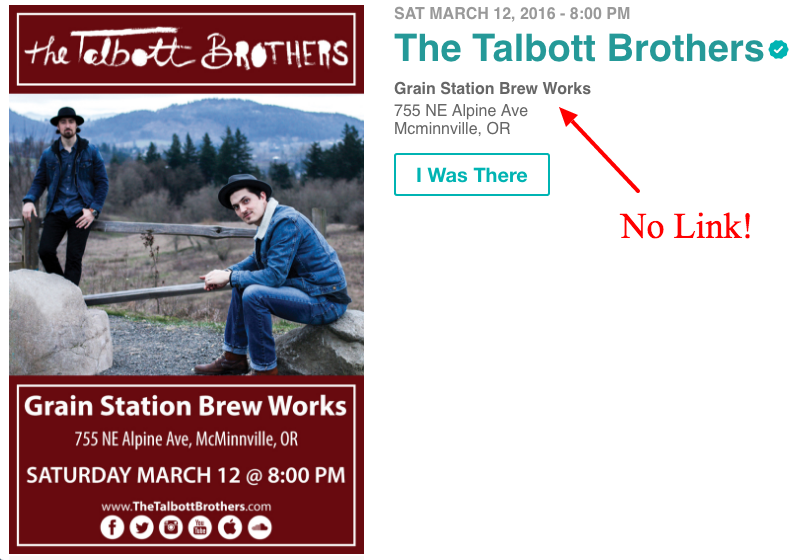 Most links on most social platforms are “nofollow,” meaning they won’t count for search rank. However, there are a few key places on social media where you can get some good, “dofollow” links. 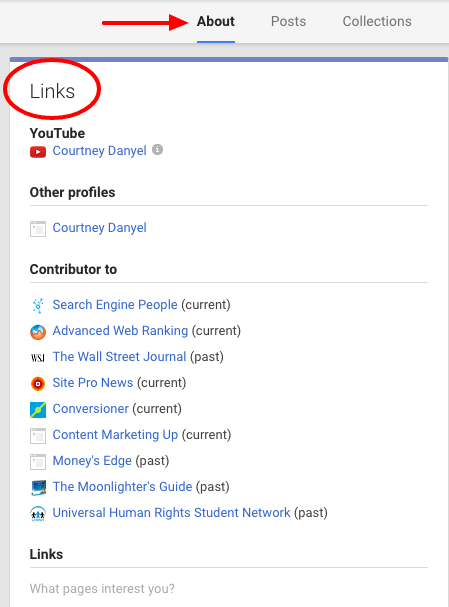 Google+ will give you a dofollow link in your profile. Just click your “About” tab. Go to Profile > About. Add your website URL in Links. Click “edit” at the bottom, then you can add your website URL. Ask your team members to add the link to their profiles as well. Links in your video descriptions and comments don’t count, but you can get a dofollow by including your website’s link in a channel header. Once you’ve created a custom YouTube channel for your company, go over to the “About” section to add a link. LinkedIn allows you to link to your website in your profile. Just click “Contact Info” under your profile header to find the option. If you select “Other” during setup, you can create custom anchor text as well. You can add two other links to your profile as well without the custom anchor text option. If you have a company profile as well, don’t miss that link opportunity. 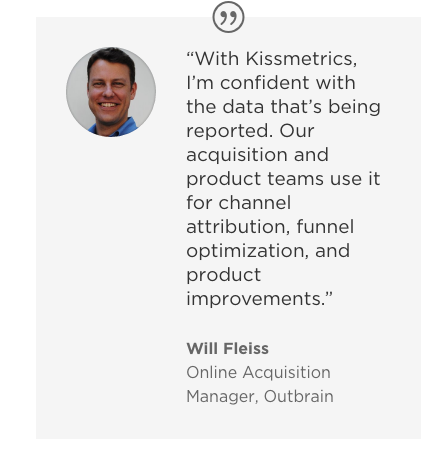 Writing testimonials is a great way to get quality backlinks pointed at your site. Make a list of the products and services you use, reach out to the owners and offer a testimonial. A lot of them would probably be interested in featuring it on their site, and giving you a link in the process. Most high authority sites like to feature testimonials from influencers in their niche. So if your website’s brand new, you’re probably not there yet. 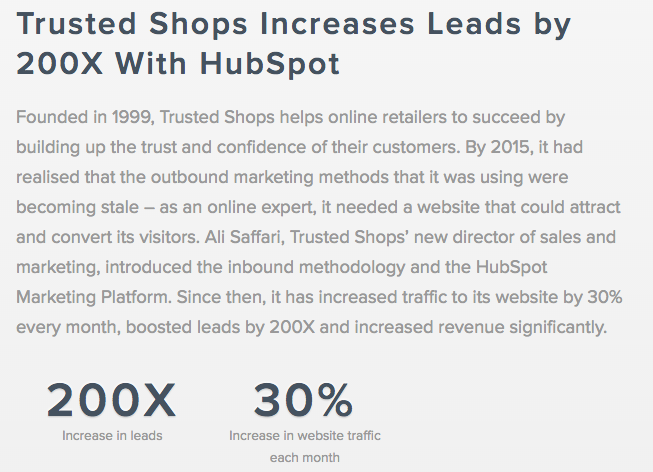 Turn your business into a success story using their tool to get quality backlinks. 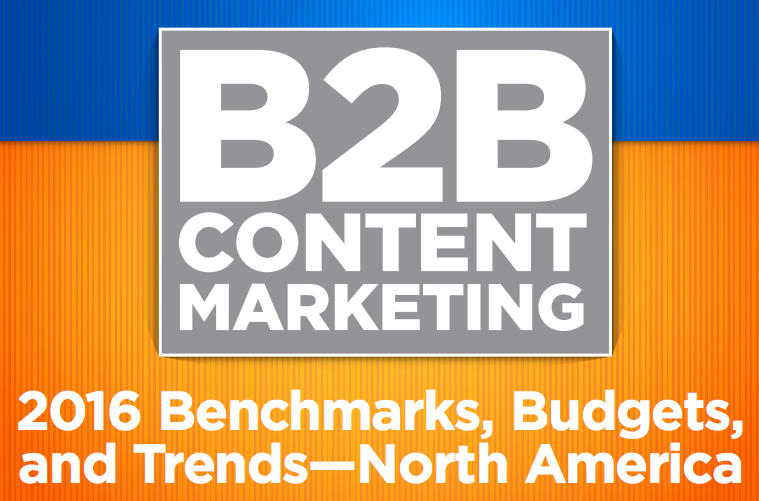 When planning how to get quality backlinks, most people want to avoid guest blogging. If you have a brand new site, I understand why. Most blogs are looking for contributions from influencers and experts, which you might not be (yet). 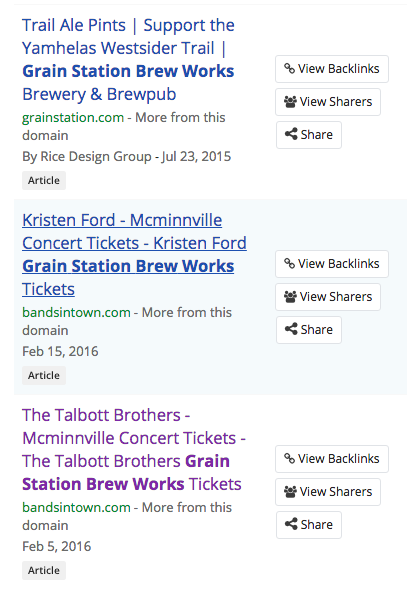 But I can tell you from experience that this is a great link building strategy, even in the beginning. I made a major career shift (I have an MA in Anthropology — Go Cougs!) but that didn’t stop me from getting high quality guest post opportunities after 6 months as a business writer. This is easy enough to do with Google and some other tools. 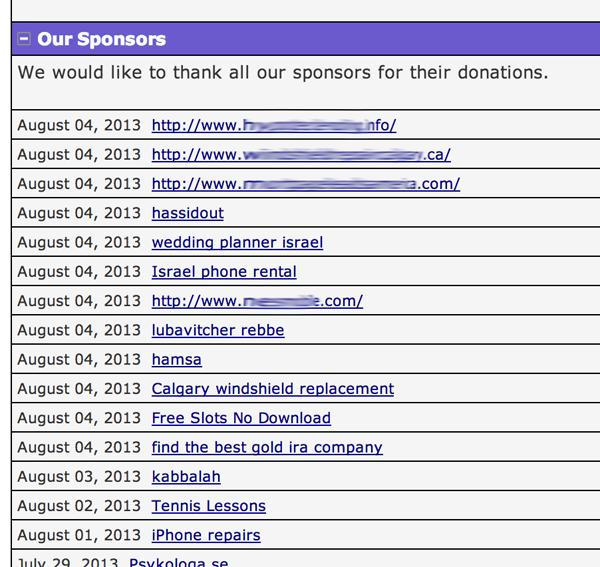 I mentioned before targeting your competitors’ backlinks, including those from guest post contributions. Make a list of competitors, influencers, and colleagues in your niche, and check out their sites to see where they’ve contributed. 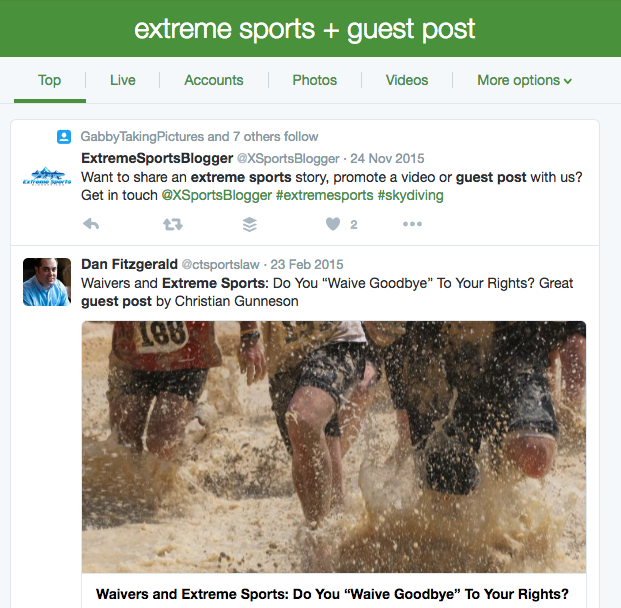 Social media platforms have advanced search features you can use to find guest posts. Just use the same keywords you use in search. You can also use a tool like Topsy or Keyhole to set up alerts for certain searches. Yeah, you read that right. Most blogs are asking for contributions from experts with lots of experience. But if you have a brand new site, don’t be deterred by this. So if they ask for submissions from experts only, ignore that. And if they ask you to pitch topics first, ignore that also. Just figure out what kind of content speaks to their audience, and write the best post you possibly can, then submit it. As long as you write great, original content that offers value, someone will want to publish it. It can take a few tries to get your first guest post, but once you do, it gets easier from there. 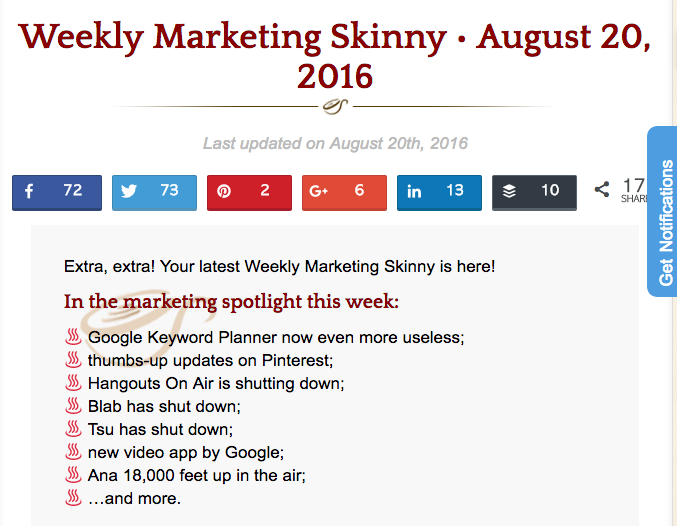 After only a few successful guest posts, I had webmasters asking me to contribute regularly. Most guest post opportunities will give you a backlink in your author bio. Google sees this kind of behavior as unnatural link building, and could penalize your site for it. Most forum links aren’t very valuable for SEO. Build links on forums the wrong way, and you can get in trouble with the host site, or Google itself. Still, you can get quality backlinks from forums if you know how to do it properly. But don’t make the mistake of posting links on every forum out there. Select one or two relevant ones to focus on, then create a user profile and start building a following there. Links in forum comments are usually nofollow on most platforms. But even if the strategy isn’t helping you build links for SEO, it does help you build authority and gain traffic. Keep track of blogs in your niche that publish link roundups as an easy way to get quality backlinks early on. Also just keep an eye out for roundups on the industry blogs you already follow. When you find one that your content fits, reach out to the blogger. For sites that post weekly or monthly roundups, you can even prepare content with them in mind. Create a tool or resource. Have a tool or resource that people want to use or tell their friends about, and you get quality backlinks fast. This might sound like a big investment for a brand new site, but it’s actually perfect, because people who don’t even know you will be willing to link back. CoSchedule Headline Analyzer is probably my favorite example of a useful tool that gets links. It’s one of those tools that literally any blogger can benefit from, and since it’s free, marketing experts across the web recommend it to their audiences and link back. But if coding a tool just isn’t going to happen, there are plenty of other resources you can build that have the same effect. Yes, these kind of resources take ages to make. But if yours is the best one out there, than people will link to it, even if they don’t know you. 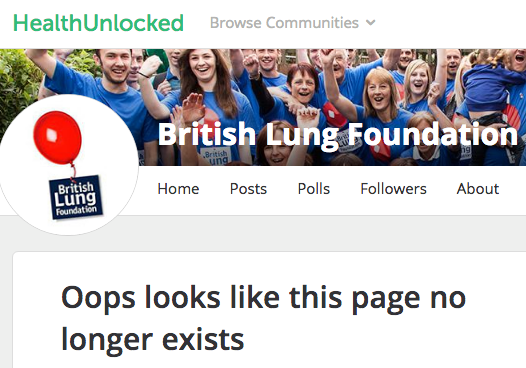 You used to be able to get quality backlinks by donating to charities, but this is a risky tactic now, because it looks a lot like buying links (which is against Webmaster Guidelines). 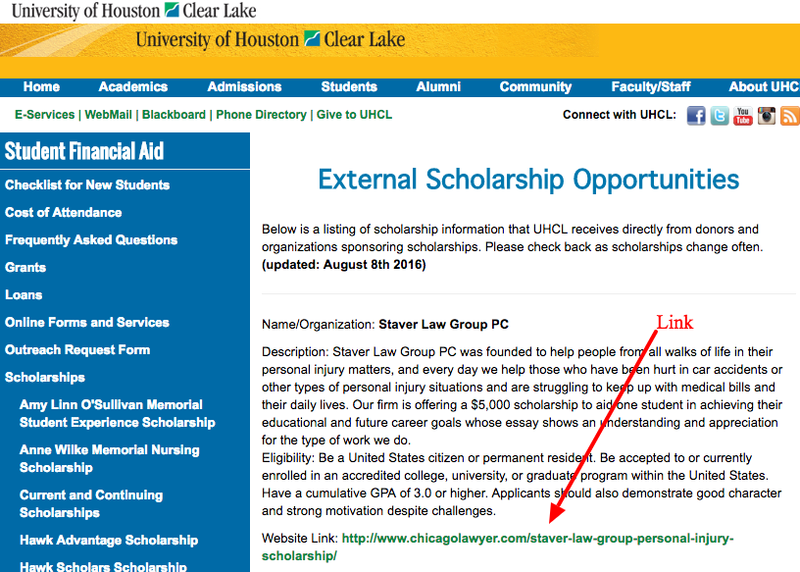 But you can still get a legitimate .edu link by creating a scholarship that educational institutions link to. This will obviously require investment on your part to create the scholarship, but luckily, you can get a tax break for it in addition to some great links. There are some logistics and legal requirements you’ll need to meet to set it up as well. When in doubt, turn to WikiHow: How to Create an Educational Scholarship Fund. The scholarship should be as relevant to your niche as possible. For example, a tech blog could create a $1000 scholarship for IT students. 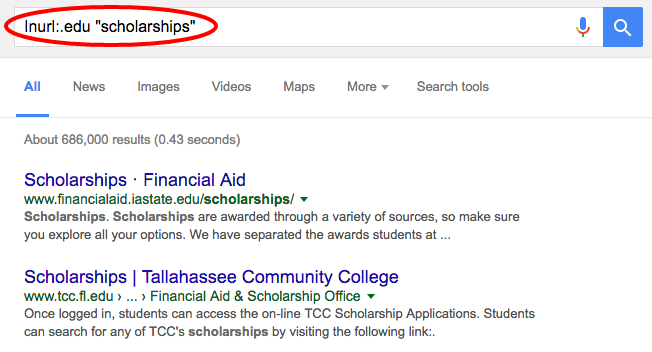 Look for pages that are hosting external scholarships, not just scholarships from the university or NSF. Use this strategy the right way, and you can get quality backlinks from 100’s of high authority .edu sites. Get high PR backlinks with an infographic. Infographics are a powerful tool to get quality backlinks — no matter who you are. Today, infographics are liked and shared on social media 3X more than any other type of content. And if you’ve created an attractive and informative infographic, people will want to discuss it on their sites and link back to the original. Infographics don’t have to be all about “the latest industry research.” They can be about anything your audience is interested in. Use tools like Google Trends and Answer the Public to see what questions people are asking about keywords related to your niche. 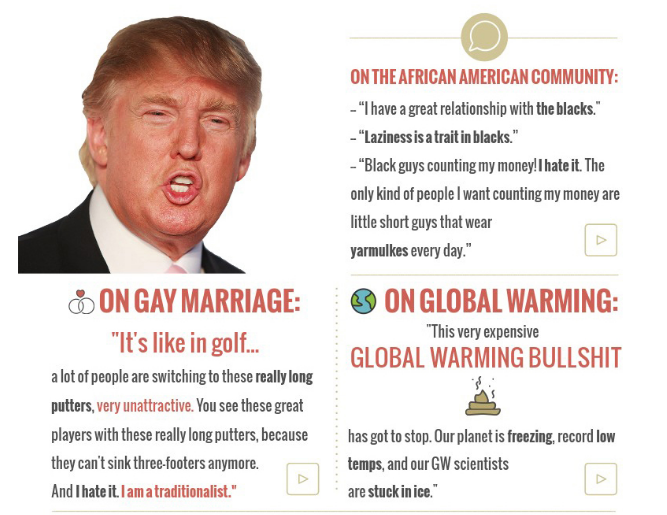 Can you turn this question into an infographic? 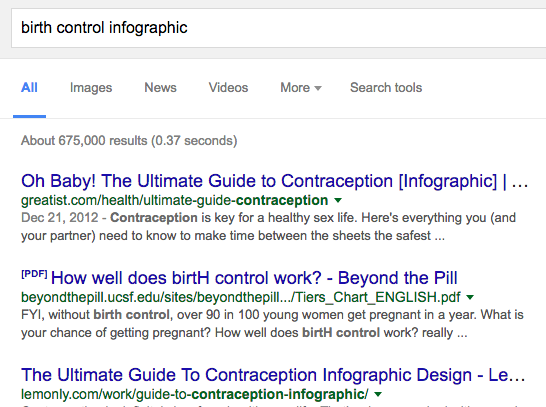 One of my favorite examples of a timely infographic is “Control of Birth Control” by Good. This one came out in March 2012, a month after Obama announced a controversial policy that all women will have access to free contraception in the US. Once you’ve found a relevant topic for your niche, see if anyone’s already created an infographic on that topic. If they have, can you make a better one? There are plenty of tools out there that can help you create your own free infographics if that’s all your budget allows. But designers are more affordable than you might think, and can use their professional skills to create you something really unique. Before opting to make it yourself, I recommend checking out places like Dribble or Fiverr to find affordable designers with experience and a portfolio to show it. Once your infographic is ready, create an embed code so it’s easy for people to share on their own blogs. Siege Media Embed Code Generator can do this for you. Host the infographic as a standalone URL and as part of your blog content, so people can share that as well. Your most successful competitors have been at this for a while and know how to get quality backlinks. As a result, the same backlinks that improve their authority can help you as well. You might already know some of your competitors off the top of your head, but I recommend making a comprehensive list to target. First: Find your most successful competitors. Head to Google and search for the best blogs related to your niche. You’ll probably come up with some list posts you need to mine. Second: Find your closest competitors. Every niche has a broad and narrow, so go through the list and identify which are the closest to your unique business position (if any). 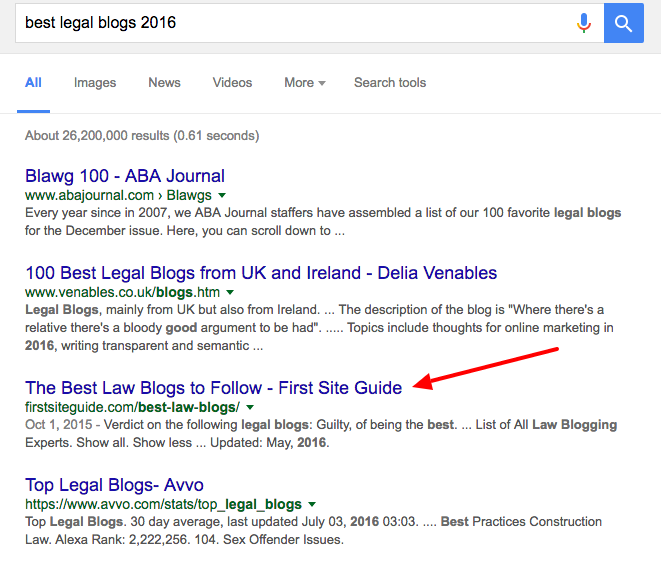 For example, the list from UK and Ireland I found in search would include blogs with the most relevant backlinks for another UK-based legal blog to target. This is easy, thanks to Ahrefs, Majestic, or Monitor Backlinks. 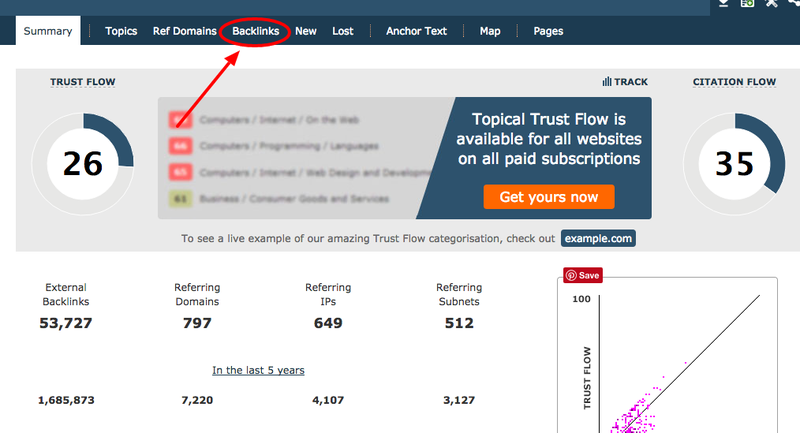 Just pick a tool and enter your competitor’s domain to search their database for backlinks. Unfortunately, you can’t get much done with these tools unless you sign up for a premium account, but both services offer trial periods as well. Fourth: Create a strategy to replicate. It won’t be possible to replicate every link you find, such as old news citations or links from private blog networks. Really liked working with @danyeltravels when she wrote for the SEP blog. Solid writer, professional, timely. True professional! A content writer who speaks to your audience @danyeltravels. Couldn’t have asked for a better researcher/writer. © 2019 Courtney Danyel. All Rights Reserved. Need a lot of content? Get 10% off on bulk projects or 20% off if you hire me on monthly retainer. I also offer discounts if you pay in crypto!Get a Quote Now!